When it comes to building an online presence for your business, there are a large number of steps involved. Creating a website is a complex process requiring design, coding and of course content. 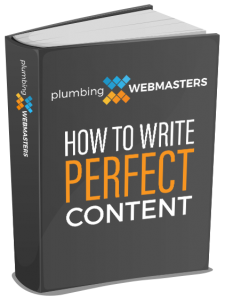 In this guide to creating perfect content, we will reveal the successful methods we use to curate content that not only optimizes well but converts traffic to leads. When you launch a website with pages of content, that content is eventually “indexed” by Google and what Google finds when they index your site determines how they will rank you. They are looking for many basic building blocks that indicate who you are, what you are about, the page topic, and which searchers be sent there. Once upon a time, getting your content to rank was simple. You could throw up a list of keywords on your page and Google would rank you for those keywords. During this stage, people began what is called “keyword stuffing”. Keyword stuffing occurs when instead of a well-written page of in-depth content, you create paragraphs that continually repeat the same set of keywords. An example would look like this: “We are a plumbing company in Denver. Our Denver plumbing company is the best plumbing company in the Denver area. In this guide, our digital marketing experts explain how to properly implement keywords into your content. Keywords are the words people will use to find your website. These are the queries people type into Google or other search engines such as “plumbing company in Denver.” While the above example does emphasize those keywords, it does so improperly and is considered to be poor or spammy content by Google and other search engines. Writing your content with user intent in mind is not only important for the user experience, but also for Google. Believe it or not, the search engines can assess how well you are addressing your audience, if you are answering questions and if your message is easy to understand. You can focus on how to best portray that message. One of the most important components of your websites content to Google is how authoritative you are on the topic at hand. Remember Google’s goal is to send its users to the best authority for the query at hand. Google wants to send its users to a website that answers the question they are asking or points to the service they are searching for. That is why well-researched content will optimize better than content you throw together in minutes and is disorganized and confusing. Not only do you need to have a clear purpose for your website’s content, but you also need to have depth. As time has progressed and Google’s algorithm has improved, they have constantly updated it to weed out spammy websites. One of the more recent updates was called the Panda update. This update penalized websites with shallow content. Google wants to see a well-crafted page that covers every question a reader may have about the topic at hand. Your content should be lengthy, but should also have true depth-of-knowledge, not simply fluff. Your content also needs to have a unique value. This means not only can you absolutely never use copied or duplicated content (Google will know! ), your content also needs to have a unique value. For example, if you are a plumbing company in Denver, you may be presenting information that is already available online. However, you can present it from the unique perspective of your specific plumbing company. You can lay the information out in a format that is easier to read, easier to navigate and across the board geared better toward your audience. You also may be presenting pages that do not exist in your area on specific plumbing service types, adding unique value to those pages. When you place keywords in your content you have to be careful to not stuff your content with them but to also retain enough for Google to understand what your page is about. As Google’s algorithm has improved, their ability to detect related keywords has also increased. In fact, Google wants to see not only the same keyword repeated but also related ideas. For example, a page about “plumbing services” should also cover related topics like drain cleaning, faucet replacement and more. It should include related verbs also such as repairs, installation, and replacement. The art of placing enough keywords in your page combined with your city without overdoing it is the difference between a well-crafted page and a spammy page. Ultimately, your page should be written with the audience in mind and the keywords should naturally flow into the content. Our Plumbing Company in City is the best company to choose for superior service. Contact our Plumber today at 888.888.8888. The first component of this is the SEO Title and when you write your SEO title you need to use the most important keywords for that page. For your home page, this will be your primary keywords. For your interior pages, this will be your secondary keywords. Content is not a simple case of throwing words up and hoping for the best. To construct perfect content you must dedicate hours of research, writing, implementation of proper SEO tactics and more! Over the years we have learned exactly what the key ingredients are for the perfect page and the exact way to implement those ingredients. Like constructing a home if you skip a single step of building the foundation, putting together the frame and finally adding all the final features, your home will be shoddy at best. Updated on April 3, 2019 at 3:44 pm by Plumbing Webmasters.